A key question any organization, including non-profits, will have to (eventually) answer is what is What Is Your Business Model? How will you fund your operations to stay in the game, let alone prosper? The question is easy to ask. The answer – not always. You don’t necessarily start with a Biz Model. Disappearing message phenomenon Snapchat has millions of customers and a rumored valuation of $3 to $4 billion yet no revenue at all. Whatever else it may be, no revenue is not a business model. Similarly, Twitter, after seven years and tens of billions of tweets has yet to approach profitability. Its recent successful IPO gives it space to continue to optimize its business model. Another increasingly popular phenomenon is online instruction. From rather crude beginnings, such as MIT’s open courseware – at first not much more than an online syllabus and lecture notes – the online learning platforms have improved and the number of courses increases substantially. These have become complete courses, not just someone giving a lecture on YouTube. Commentators some times call these online courses by the ungainly acronym, MOOC, as in Massively Open Online Course. MOOCs are created by individual universities but commonly syndicated to students through portals such as Coursera, Udacity, and EdX, which offer courses from many schools. For an overview of the range of online courses see mooc-list. The courses are generally free. This begs the question – what is the business model? What pays for the software, services, video production, and staff let alone a return on investment? Visitors to MOOCs generally don’t see embedded ads or even offers to buy logo wear or tsatskes similar to what traditional colleges offer. Advertising and merchandising would detract from the platform, without providing enough revenue. A few MOOCs have tried explicitly charging up to a few hundred dollars per course, but the abundance of free alternatives just a click away has so far thwarted a direct pay to learn approach. Looking at the latest crop of online courses, providers seem to have been thinking about other ways to increase revenue and been evolving from a free to freemium model. Freemium is common with services from online gaming, e.g. Zynga, to web based storage, e.g. Dropbox. Typically, there is no charge to start and you can continue to use a modest amount of the service at no charge. Use more or avail yourself of advanced features and you have to pay. In the case of online education, refinement of the business model also entails changing the value proposition and the essence of the product. Instead of requiring students to pay for the instruction, MOOCs ask them to pay for verification that they took the course. That is, students pay for some form of an e-certificate of completion. As in the brick and mortarboard world, the product is not so much education as certification. For example, visit Coursera and the heading on the home page proclaims – Take the world’s best courses, online, for free. However, select a course from the extensive course list at and you’re presented with a choice – “Learn for Free” or “Earn a Verified Certificate.” The certificate costs $49. Verified certification is but a part of Udacity’s upsell. For about $100 a month, it offers “Udacity Coach.” Students get guidance with course projects and help with assignments. Students, who do not upgrade to Coach, can only ask questions to an online forum, with no guarantee of a satisfactory answer or indeed any answer at all. As a not-for-profit, edX uses your contribution to support our mission to provide quality education to everyone around the world, and to improve learning through research. While we have established a minimum fee, many learners contribute more than the minimum to help support our mission. 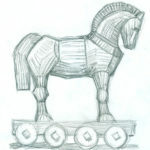 The funds go towards class creation and improving EdX. For any of these programs, would friends, relatives, or prospective employers be impressed with a stack of such certificates? How impressed would you be to see not a diploma on the wall, but a tablet with the image of a certificate? MOOCs might try many other possible business models. What’s encouraging is that they are actively experimenting. When is the last time your organization examined its business model? This entry was posted in Uncategorized and tagged business model, education, marketing, MOOC, online on January 18, 2014 by Peter Buechler. 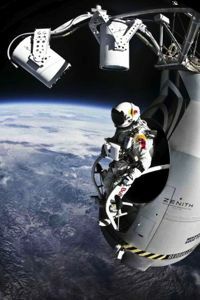 Baumgartner didn’t float silently into the Guinness World Records on his logoed parachute. The feat garnered front page mention in the New York Times, the Wall Street Journal, USA Today and leading world newspapers. It was featured on major broadcasts, while some 8 million viewed the jump streaming live in some 50 countries. In PR speak, it got a lot of ink. The big jump was more than the work of a stuntman and a few of his buddies going for bragging rights. It was the joint effort of a sizable technical and scientific team, which has been working on the project since 2007. Who funded this effort? Fellow Austrian company, Red Bull, the maker of the caffeinated and sugared “energy drink,” seen in skinny 8.4 oz. cans. Privately held Red Bull, won’t disclose the cost of this project, but from the roster of equipment and experts, it would have had to been eight figures. Whatever the budget, it could have bought Red Bull could have bought a lot of traditional advertising and sales promotion. Red Bull sponsors sports and games such as skate boarding, BMX biking, and surfing. Events it believes will appeal to its aspirational target – young, , cool, active, male. In this case, it both connected with core customers and transcended conventional marketing to creating a phenomenon. The positioning and messaging were as on target as Baumbartner’s flawless landing. No amount of advertising alone could have done so. We may never have the resources to stage such an event. Instead of being yet another sponsor at yet another show, we can still strive for promotions, which are relevant and remarkable. This entry was posted in Uncategorized and tagged advertising, marketing, PB, promotion on October 17, 2012 by Peter Buechler.